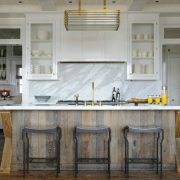 Designing or renovating a kitchen can get homeowners stuck on what sort of look and feel to go for. 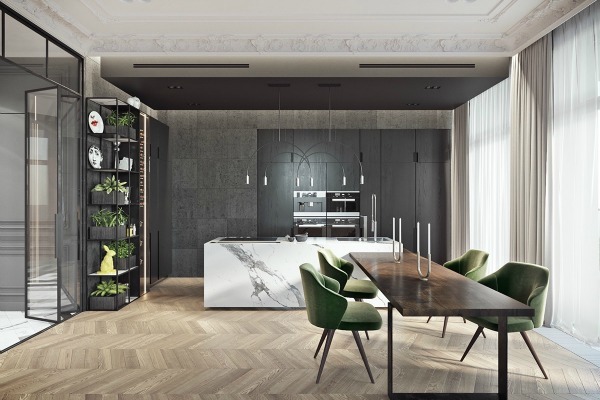 But, the latest in design trends are putting the unlikely together to curb that decision-making by blending two polar opposites – marble and wood! 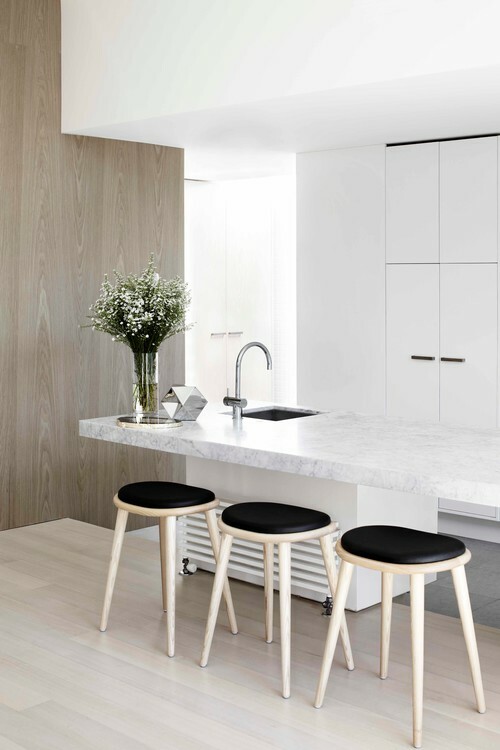 The combination of marble and wood is the ultimate textural contrast. The cool look of marble paired with the warmth of wood opens a world of diversity when it comes down to accessorising your kitchen. It will allow you to mix traditional with contemporary, rustic with elegance. Don’t be afraid to take this look outside of the kitchen. We’ve seen some great project plans come in. Pairing a marble fire surround with wooden floors or wooden floating shelves. Marble bathtubs with timber cabinetry. The options are easy and endless! 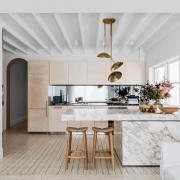 Here are some of our favourite marble and wood schemes we’ve found online. How wood you do it? Shop our online catalogue to get this look! Leaders of the fashion world, Vogue Magazine, pays homage to a mutually-loved material – marble. Here is a selection of their favourite marble kitchens and bathrooms. This is living proof that marble adds an immediate luxe touch to any home. Here at Vogue Living, we’re lucky to see a lot of amazing and incredibly inspiring homes. And while every home holds its own uniqueness, after a while you’ll notice a few elements that all beautiful homes share. Sure, an eye for great furniture design and chic colour combinations helps, but there are other more, shall we say, material matters that make up a VL-worthy home. We’re talking, of course, about marble. 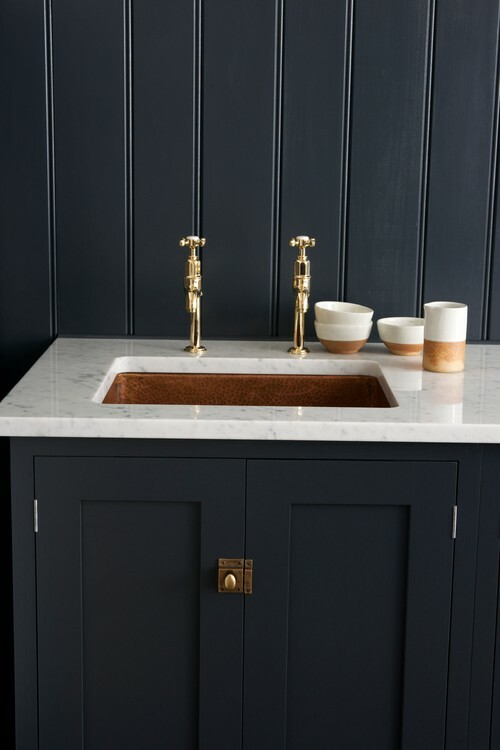 Based on the sheer prevalence of marble in many of the homes we shoot or feature in VL, we have well and truly noted the unmistakable appeal of this luxurious looking finish. While its cool aesthetic and tactile appeal is obvious to any eye, we love the way you can use various colours to accent your home – most commonly in places like the kitchen and bathroom. 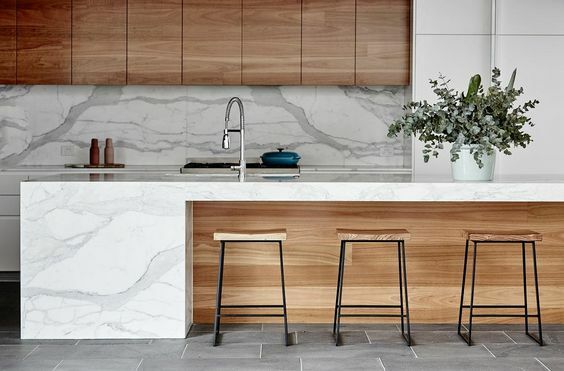 Seen on bench tops, splashbacks and kitchen tables, the beauty of marble means you can use it in myriad ways to create a sense of decadence and luxury to your home kitchen. 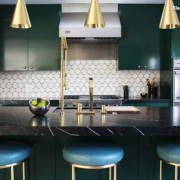 So, in honour of our enduring love for the most opulent, yet hard wearing of materials, we give you 15 of our favourite marble kitchens. Shop this look at VSG. We suggest Damasca. 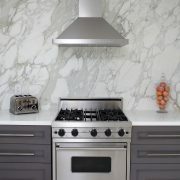 Shop this look at VSG with our Carrara range. Shop this look at VSG with Arasbecato Corchia. Shop this look at VSG with Arasbecato Don. Shop this look at VSG with Negresco. 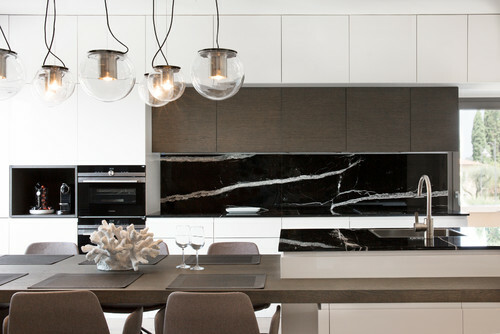 Read Vogue Living‘s full article on the stunning usage of marble kitchens and homes here. Induction Cooktops are hot on the market right now! They are super-fast heating, instantly responsive to changes in temperature settings, easy to clean and look immaculately sleek. These new-age stove tops generate heat using electromagnetism, rather than gas or electricity making them much more energy efficient out of the three. 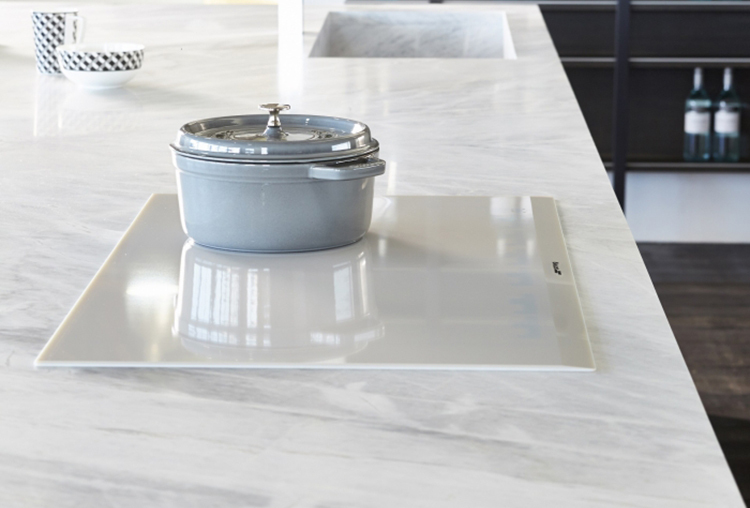 Induction cooktops cook food faster and lose less heat in the process as they generate heat directly to the pan. 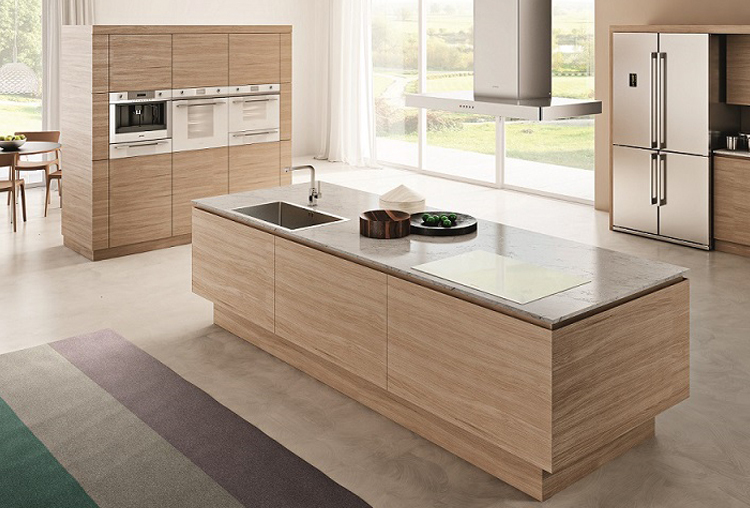 We have had customers through recently asking if induction cooktops can be installed into natural and recon stone benchtops. And the answer is yes. Here are some looks that we’re loving right now. Smeg’s all-white induction cooktop. 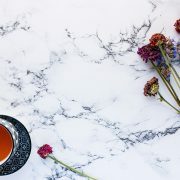 Also available in black – but look at how flawless it is on a Calacatta marble benchtop. 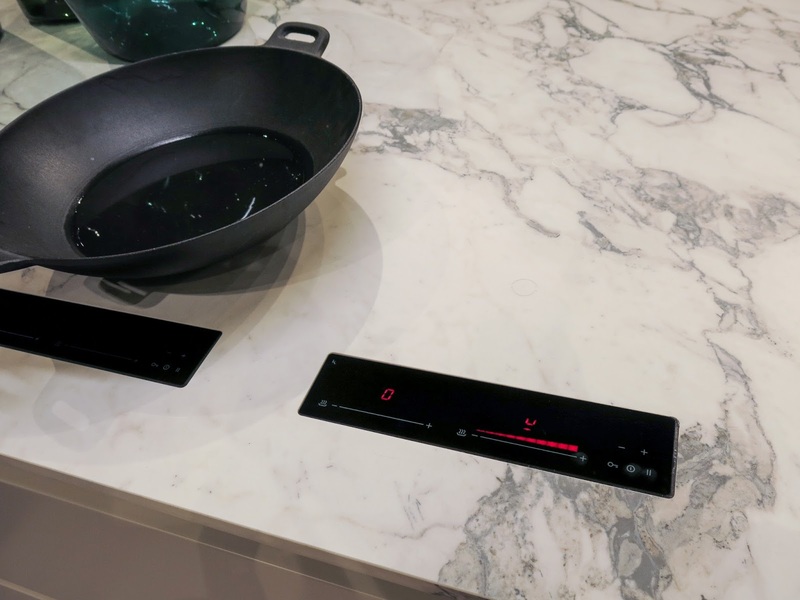 Binova’s invisible hob built into a recon marble-look benchtop. Convinced yet? 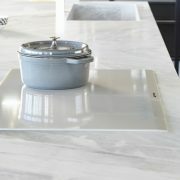 Browse our catalogue online and see what stone surface you would pair with an induction cooktop! From floor-to-ceiling marble bathrooms to splashbacks with sensational veins, here’s a gallery of marble marvels. 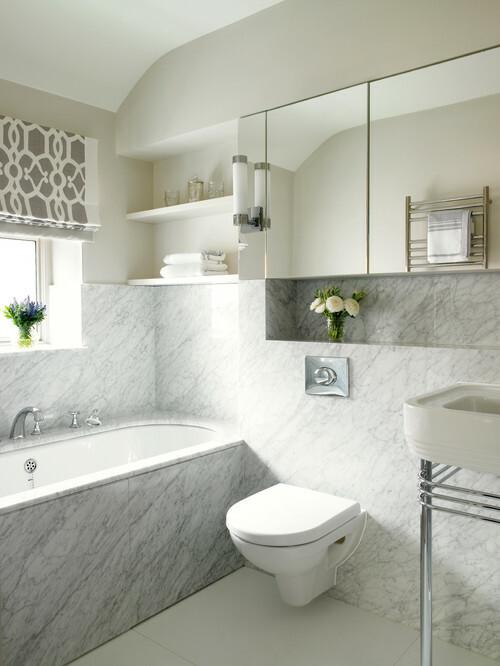 Are you thinking of including a marble feature in your home? If so, be prepared to be inspired. 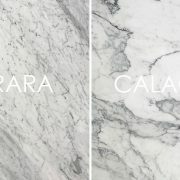 From the popular marbles such as Cararra, Calacatta and Statuario, to Nero Marquina and other exotic-to-Australia types, and from great slabs of marble to tiles (and marble-look alternatives), here is a quarry’s worth of images that show myriad ways this wonderful natural product has been used across the globe. Why we love it: The veining in the marble is sensational, and adds an element of luxury to the more rustic/ low-maintenance aspects of the kitchen. 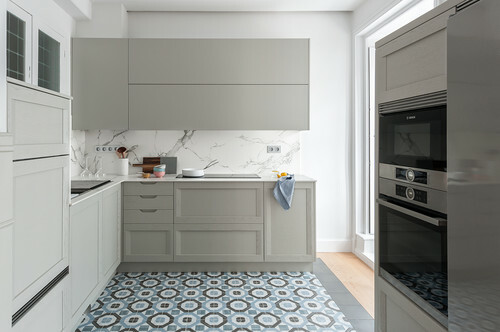 Why we love it: Marble-look surfaces feature throughout this property, giving this apartment a funky retro air – not a look commonly associated with white marble. It’s one for the books. 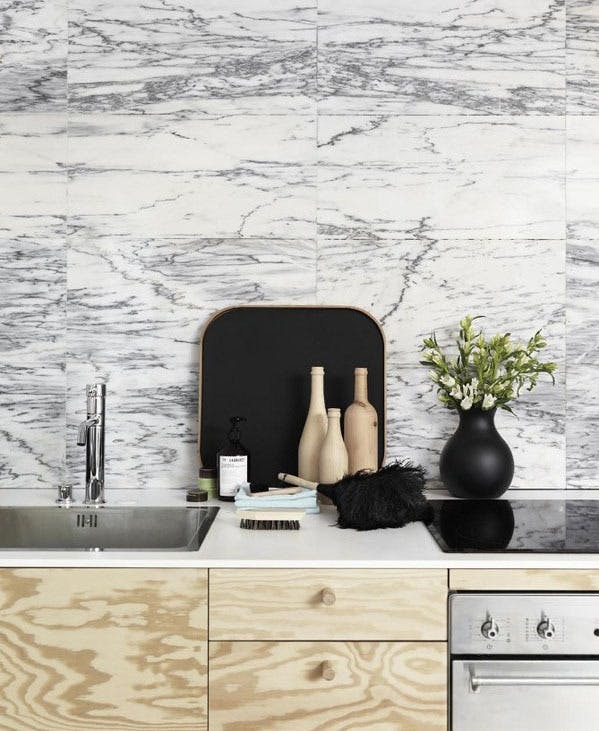 Why we love it: Marble is so well employed in this splashback, especially as it acts as a contrast to the black joinery surrounding it. Again, it is an easy way to add a layer of sophistication to almost any scheme. 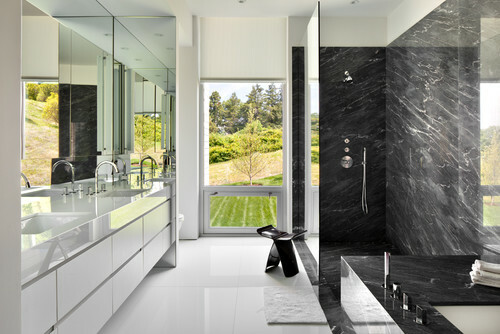 Why we love it: Marble, marble, everywhere… This would just be a stunning bathroom to walk into, let alone to use. The way the timber pops out from the patterning is something to be admired. A brilliantly executed interior. Why we love it: Using marble with restraint also works well. This marble-tiled floor, paired with high ceilings, gives this room gravitas. 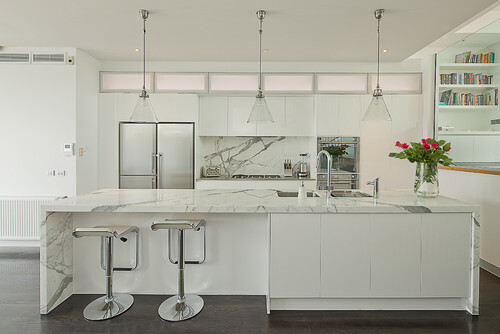 Why we love it: The repetition of white marble-clad volumes emphasises the luxury of this relatively small kitchen area. A great example of using this material to raise the stature of a space. Why we love it: Just stand back and take it in. 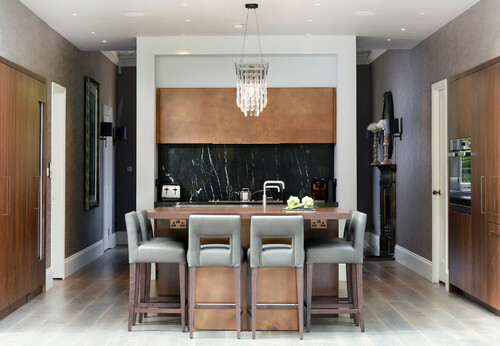 We love the invitation to admire this stunning space, and the way the marble panels used solely on the outside of the island bench, tone down the ‘look at me’ aspect just enough. 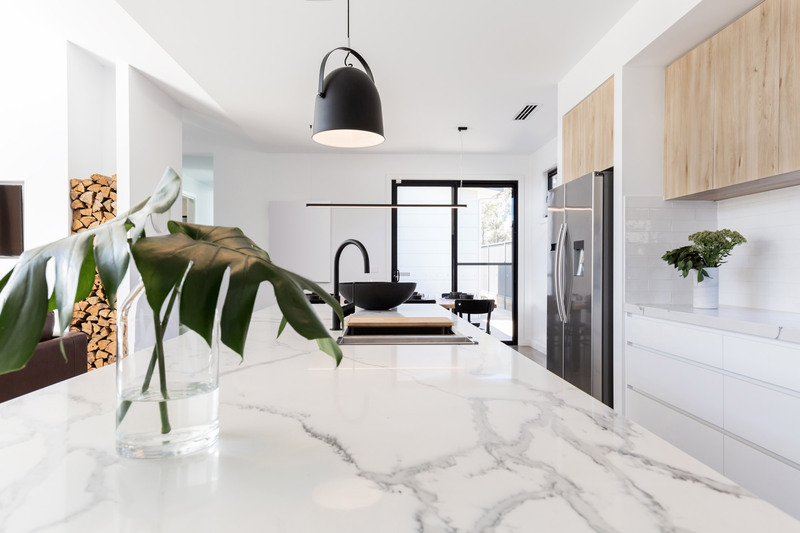 Why we love it: We can’t say it enough… the veins maketh the marble, especially so in this Statuario marble benchtop and splashback. Why we love it: Because sometimes a light touch is enough too. Why we love it: Marble isn’t all light and beauty. Sometimes it adds a darkly dramatic element just where it’s needed. Why we love it: Case in point. 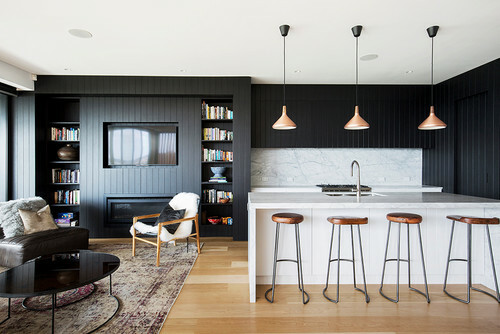 Why we love it: Because this is a great example of how black marble can elevate a room from ordinary to extraordinary. Why we love it: The Statuario marble island bench is the hero of the renovation of this Grade II (heritage) listed Regency house, the ‘furniture’ element anchoring the kitchen and providing a proportional contrast to the tall Georgian windows. Why we love it: Imagine this bathroom with plain white walls. 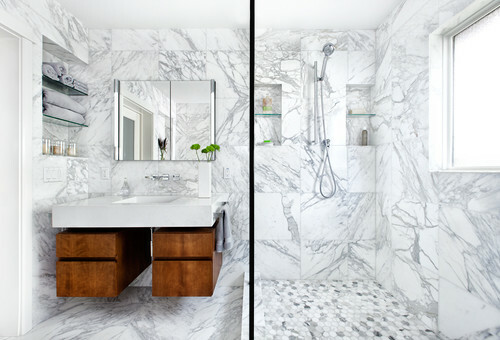 The inclusion of marble lifts it into another realm. Why we love it: Marble can break out of the ‘simple and sophisticated’ cliche. Here it’s paired with lively patterned tiles to beautiful effect. 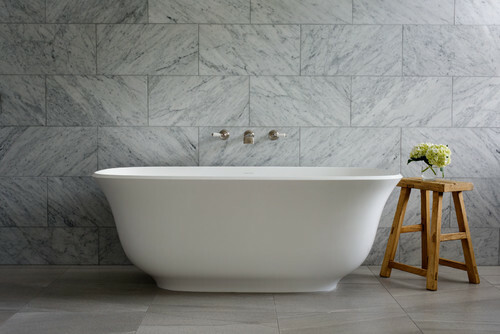 Why we love it: The interesting but not overwhelming marble tiles are the ultimate backdrop for the organic-shaped bath. Shape and material working harmoniously. 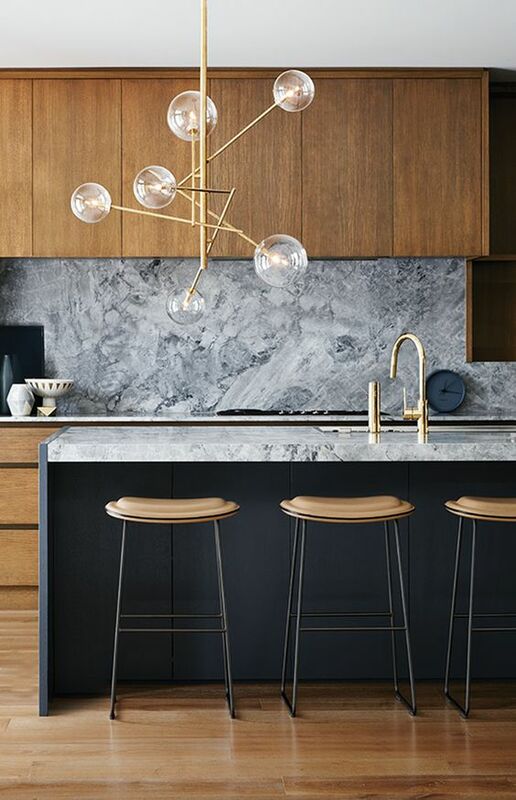 Why we love it: We love how marble isn’t the standout material here, but provides the link between the dark upper cabinetry and textured cladding on the base cabinets. A lovely and interesting combination. 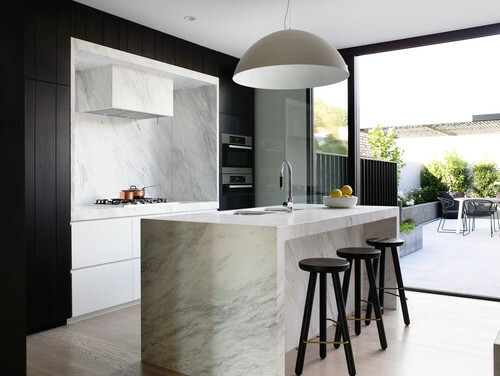 Why we love it: The black Marquina marble is an incredibly striking feature in this kitchen, adding a dynamic element to a very restrained scheme. 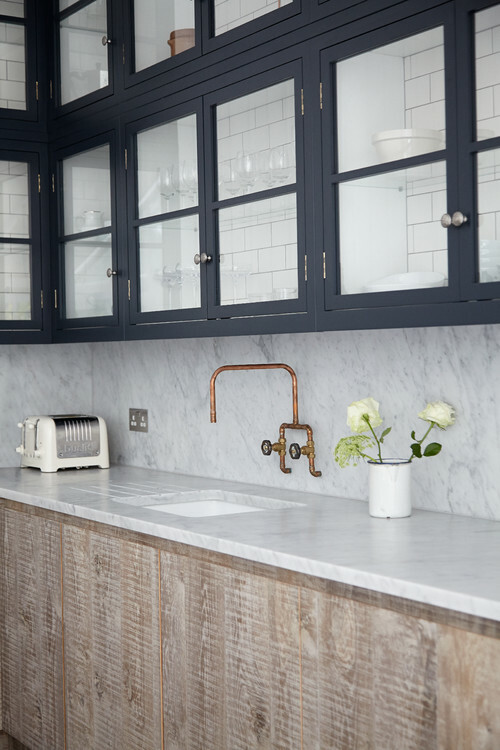 Why we love it: Understated marble teamed with dark blue-grey cabinetry. Gold. Why we love it: These tiles lift the energy of this Swedish powder room no end. See the next top 20 here! 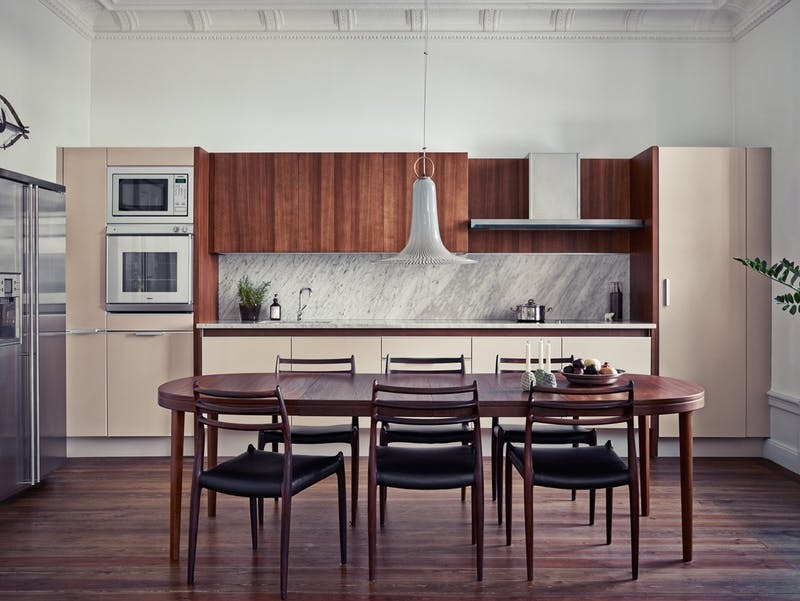 Dying for a marble benchtop but the thought of maintaining clean marble is daunting? Architectural Design share these Clever, household tips on how to keep that marble surface as beautiful as the day it was installed! 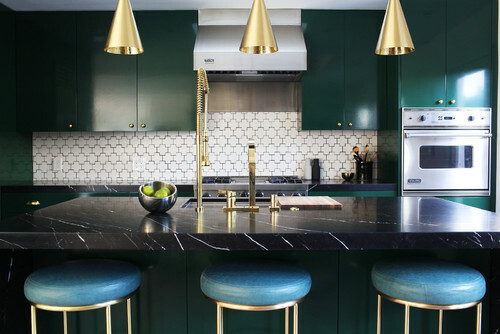 The marble kitchen counter of your dreams (and Pinterest boards) is finally installed—but wait, there’s a catch: how to clean marble? Keeping marble countertops and tile clean is actually simpler than you’d think. But, as with maintaining any surface and most things in life, you need to know what you’re dealing with. Now there’s day-to-day marble cleaning and then there’s the kind of tactics you’ll need to employ if Uncle Pat puts the punch bowl on his head at dinner and spills Cabernet across the length of your beautiful, white marble island. You got this—here’s how to clean marble and make it stay that way. Know your marble. Think like the marble. Be the marble. 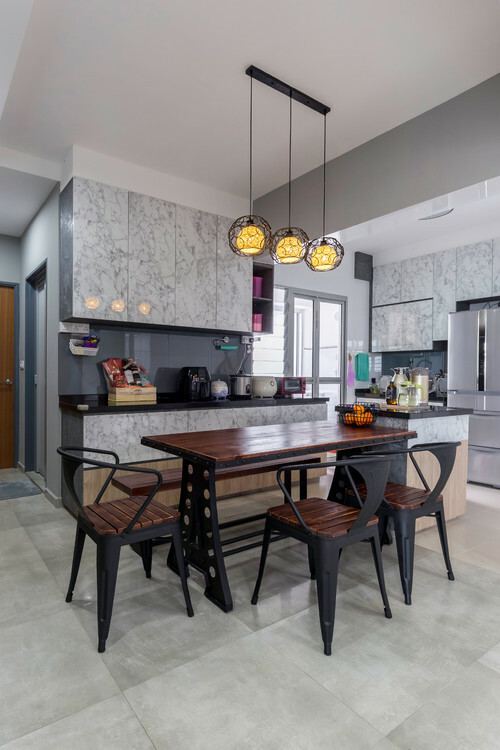 Marble is more porous than other common countertop materials like engineered stone (sold often as simply “quartz”) or soapstone, so it can be prone to staining and etching (a.k.a light scratching or physical changes to the stone itself). You’ll want to clean and seal yours regularly. More on that below—and easy enough to do before you’ve had coffee, promise. Prevention is key. Whatever marble you have in your home, sealing it every few months is a good idea. According to the Marble Institute, sealants don’t make the stone stain-proof but they do make it more stain resistant—giving you a bit more time to get to big spills. Check with whoever supplied your marble for their recommendations on the right products to use (and remember to make sure it’s food safe if you’re using it in the kitchen). For marble floors, coffee tables, and other high-traffic surfaces invest in some furniture pads and some coasters—better safe than sorry. Daily cleaning. For routine maintenance and spills you catch quickly, warm, soapy water is the best for the job. Just make sure to rinse well, sop up any standing water, and thoroughly dry the surface. Also note that for marble, acid is kryptonite—so do your best to keep things like wine and lemon juice (or even cleaners that contain vinegar) away from the surface. And if they do spill, tend to them as quickly as possible. For marble floors, start with a dust mop; you want to avoid anything abrasive on the surface, and dirt and sand being dragged around by a vacuum could do more damage than you intend. Correcting etching. For water spots, light scratches, and nicks, try buffing your marble with dry #0000 steel wool. Anything deeper than surface level scratches will require a professional’s help. So if you left a lemon out on the counter and now it’s both etched and left a stain, go ahead and use the above recommendations for food stains to take care of the latter. Sadly, the etching will likely need to be polished by a professional—so be careful where you leave your cut lemons! 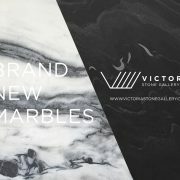 Thinking about buying Marble for your benchtop in Melbourne, Victoria? Here are some fast facts to get your shop on! Find out some more about Marble. What type of natural stone is Marble? Marble is a metamorphic rock. It forms when limestone is subjected to the heat and pressure of metamorphism. 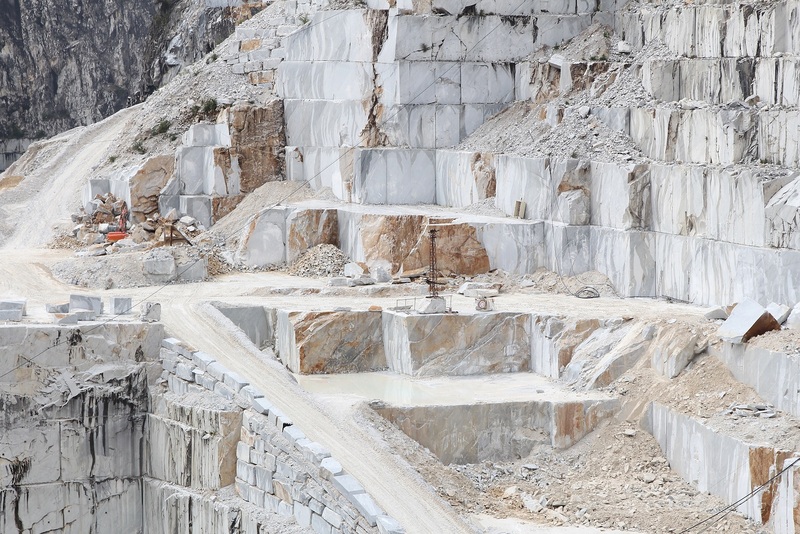 This video of marble quarrying in the Italian Alps shows some neat footage of how marble can be quarried. 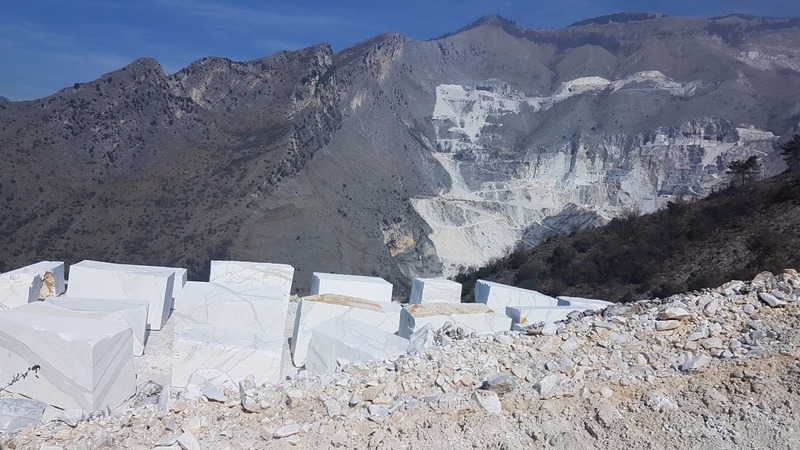 Carrara Italy – marble quarry in Fantiscritti valley. Marble works of Miseglia. Apuan Alps mountains. 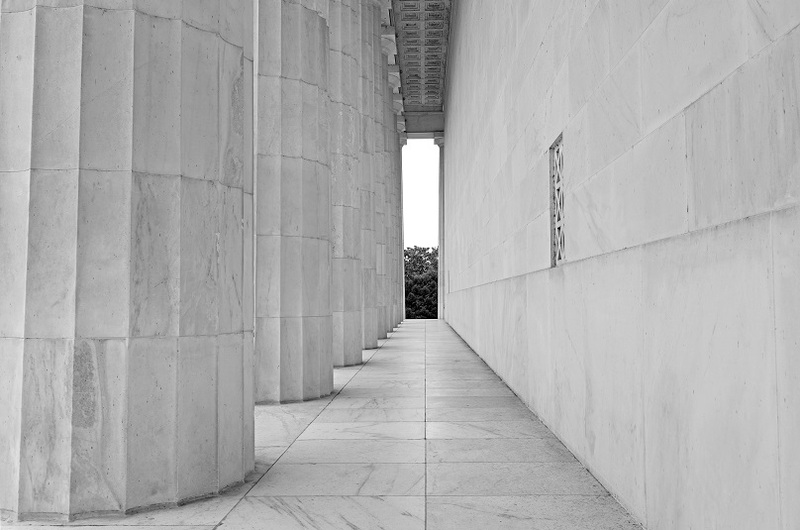 White Marble has been used for centuries in classic sculptures to construction. You might recognise it in such works of art like Michaelangelo’s, David, or the Taj Mahal, even recently in modern-day photo shoots like the one campaigned by NZ brand Lonely Lingerie where woman modelled next to Carrara Marble. 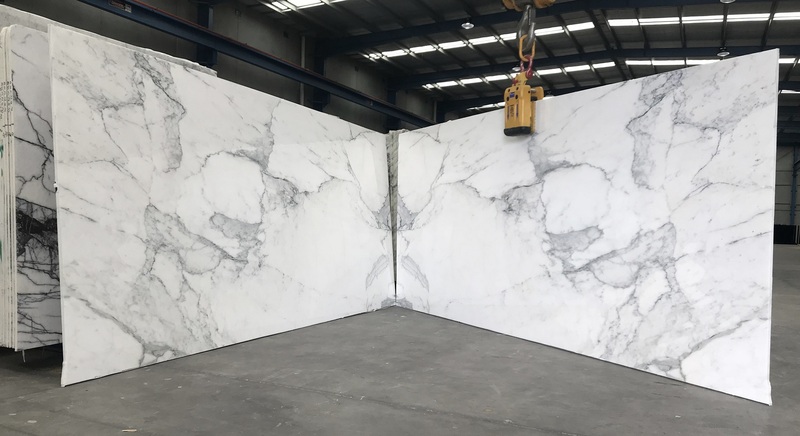 Marble is commonly used in Melbourne in the bathroom, kitchen benchtops – Where the Kitchen starts, splashbacks or reception counters. Don’t let the characteristics of Marble scare you away from using it in your home! Read our post on Marble & 5 Facts Nobody Will Tell You. Why should you choose Marble? It’s beautiful and timeless. 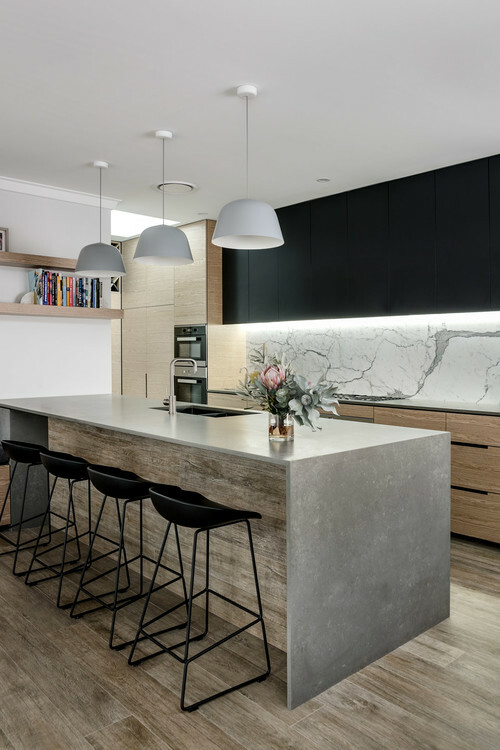 Homeowners and Melbourne stone fabricators sometimes shy away from marble being one of the softer natural stones and more prone to etching and stains. 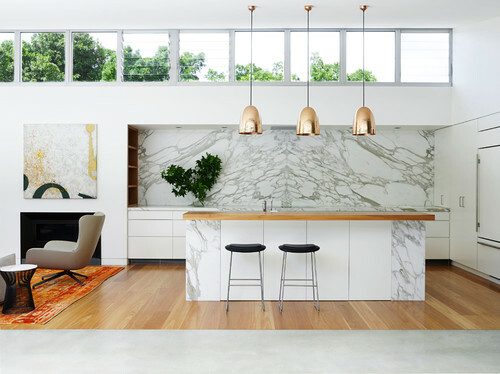 The right care will maintain it and you’ll have a stunning marble benchtop, adding value to your home. Read this amazing story on Natural Stone at home? 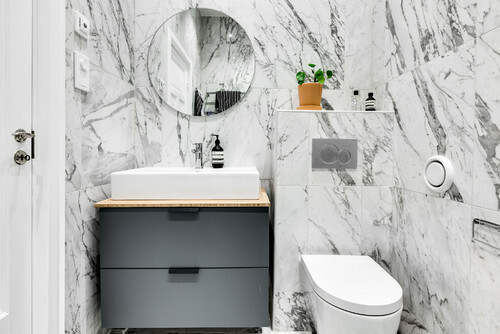 How much is it worth – who knows how much value your marble benchtop or marble bathroom may bring you! How do you maintain Marble? Be sure to seal your marble benchtop every one to two years. 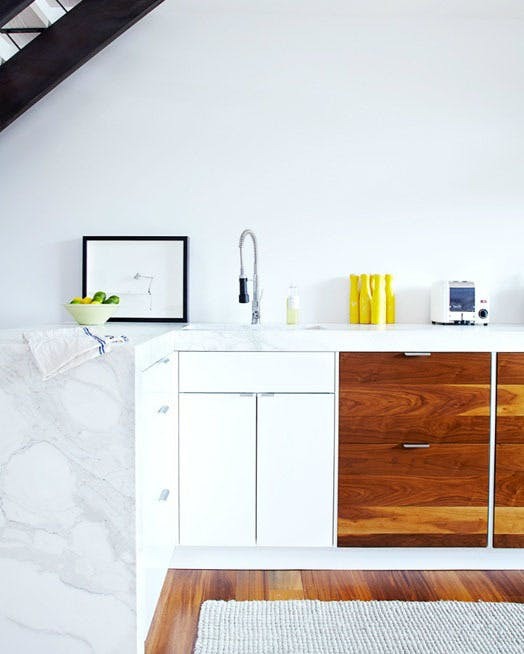 Protect your marble benchtop from vinegar and citrus’. 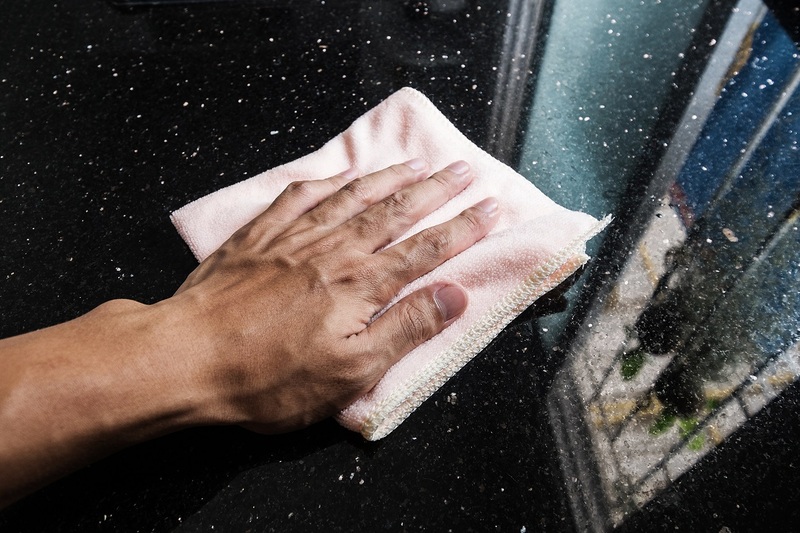 Avoid using acidic or abrasive cleaners on your marble benchtop. Check out our Marble catalogue.